A normal takeoff is one in which the airplane is headed into the wind; there are times that a takeoff with a tail wind is necessary. However, the pilot must consult the POH/AFM to ensure the aircraft is approved for a takeoff with a tail wind and that there is sufficient performance and runway length for the takeoff. Also, the takeoff surfaces are firm and of sufficient length to permit the airplane to gradually accelerate to normal lift-off and climb-out speed, and there are no obstructions along the takeoff path. There are two reasons for making a takeoff as nearly into the wind as possible. First, since the airplane depends on airspeed, a headwind provides some of that airspeed even before the airplane begins to accelerate into the wind. Second, a headwind decreases the ground speed necessary to achieve flying speed. Slower ground speeds yield shorter ground roll distances and allow use of shorter runways while reducing wear and stress on the landing gear. For takeoff, use the rudder pedals in most general aviation airplanes to steer the airplane’s nose wheel onto the runway centerline to align the airplane and nose wheel with the runway. After releasing the brakes, advance the throttle smoothly and continuously to takeoff power. An abrupt application of power may cause the airplane to yaw sharply to the left because of the torque effects of the engine and propeller. This is most apparent in high horsepower engines. As the airplane starts to roll forward, assure both feet are on the rudder pedals so that the toes or balls of the feet are on the rudder portions, not on the brake. At all times, monitor the engine instruments for indications of a malfunction during the takeoff roll. In nose-wheel type airplanes, pressures on the elevator control are not necessary beyond those needed to steady it. Applying unnecessary pressure only aggravates the takeoff and prevents the pilot from recognizing when elevator control pressure is actually needed to establish the takeoff attitude. As the airplane gains speed, the elevator control tends to assume a neutral position if the airplane is correctly trimmed. At the same time, the rudder pedals are used to keep the nose of the airplane pointed down the runway and parallel to the centerline. The effects of engine torque and P-factor at the initial speeds tend to pull the nose to the left. The pilot must use whatever rudder pressure is needed to correct for these effects or winds. Use aileron controls into any crosswind to keep the airplane centered on the runway centerline. The pilot should avoid using the brakes for steering purposes as this will slow acceleration, lengthen the takeoff distance, and possibly result in severe swerving. As the speed of the takeoff roll increases, more and more pressure will be felt on the flight controls, particularly the elevators and rudder. If the tail surfaces are affected by the propeller slipstream, they become effective first. As the speed continues to increase, all of the flight controls will gradually become effective enough to maneuver the airplane about its three axes. At this point, the airplane is being flown more than it is being taxied. As this occurs, progressively smaller rudder deflections are needed to maintain direction. The feel of resistance to the movement of the controls and the airplane’s reaction to such movements are the only real indicators of the degree of control attained. This feel of resistance is not a measure of the airplane’s speed, but rather of its controllability. To determine the degree of controllability, the pilot must be conscious of the reaction of the airplane to the control pressures and immediately adjust the pressures as needed to control the airplane. The pilot must wait for the reaction of the airplane to the applied control pressures and attempt to sense the control resistance to pressure rather than attempt to control the airplane by movement of the controls. A student pilot does not normally have a full appreciation of the variations of control pressures with the speed of the airplane. The student may tend to move the controls through wide ranges seeking the pressures that are familiar and expected and, as a consequence, overcontrol the airplane. The situation may be aggravated by the sluggish reaction of the airplane to these movements. The flight instructor must help the student learn proper response to control actions and airplane reactions. The instructor should always stress using the proper outside reference to judge airplane motion. 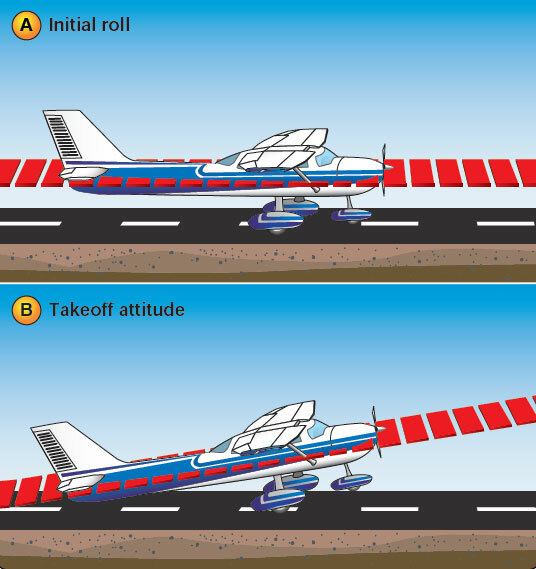 For takeoff, the student should always be looking far down the runway at two points aligned with the runway. The flight instructor should have the student pilot follow through lightly on the controls, feel for resistance, and point out the outside references that provide the clues for how much control movement is needed and how the pressure and response changes as airspeed increases. With practice, the student pilot should become familiar with the airplane’s response to acceleration to lift off speed, corrective control movements needed, and the outside references necessary to accomplish the takeoff maneuver. Since a good takeoff depends on the proper takeoff attitude, it is important to know how this attitude appears and how it is attained. The ideal takeoff attitude requires only minimum pitch adjustments shortly after the airplane lifts off to attain the speed for the best rate of climb (VY). [Figure 5-3] The pitch attitude necessary for the airplane to accelerate to VY speed should be demonstrated by the instructor and memorized by the student. Flight instructors should be aware that initially, the student pilot may have a tendency to hold excessive back-elevator pressure just after lift-off, resulting in an abrupt pitch-up. Figure 5-3. Initial roll and takeoff attitude. Each type of airplane has a best pitch attitude for normal lift-off; however, varying conditions may make a difference in the required takeoff technique. A rough field, a smooth field, a hard surface runway, or a short or soft, muddy field all call for a slightly different technique, as will smooth air in contrast to a strong, gusty wind. The different techniques for those other-than-normal conditions are discussed later in this section. When all the flight controls become effective during the takeoff roll in a nose-wheel type airplane, the pilot should gradually apply back-elevator pressure to raise the nose-wheel slightly off the runway, thus establishing the takeoff or lift-off attitude. This is the “rotation” for lift off and climb. As the airplane lifts off the surface, the pitch attitude to hold the climb airspeed should be held with elevator control and trimmed to maintain that pitch attitude without excessive control pressures. The wings should be leveled after lift-off and the rudder used to ensure coordinated flight. After rotation, the slightly nose-high pitch attitude should be held until the airplane lifts off. Rudder control should be used to maintain the track of the airplane along the runway centerline until any required crab angle in level flight is established. Forcing it into the air by applying excessive back-elevator pressure would only result in an excessively high-pitch attitude and may delay the takeoff. As discussed earlier, excessive and rapid changes in pitch attitude result in proportionate changes in the effects of torque, thus making the airplane more difficult to control. Although the airplane can be forced into the air, this is considered an unsafe practice and should be avoided under normal circumstances. If the airplane is forced to leave the ground by using too much back-elevator pressure before adequate flying speed is attained, the wing’s AOA may become excessive, causing the airplane to settle back to the runway or even to stall. On the other hand, if sufficient back-elevator pressure is not held to maintain the correct takeoff attitude after becoming airborne, or the nose is allowed to lower excessively, the airplane may also settle back to the runway. This would occur because the AOA is decreased and lift diminished to the degree where it will not support the airplane. It is important, then, to hold the correct attitude constant after rotation or lift-off. As the airplane leaves the ground, the pilot must keep the wings in a level attitude and hold the proper pitch attitude. Outside visual scans must be intensified at this critical point to attain/maintain proper airplane pitch and bank attitude. Due to the minimum airspeed, the flight controls are not as responsive, requiring more control movement to achieve an expected response. A novice pilot often has a tendency to fixate on the airplane’s pitch attitude and/or the airspeed indicator and neglect bank control of the airplane. Torque from the engine tends to impart a rolling force that is most evident as the landing gear is leaving the surface.